Now and then I get questions from followers of this blog about linocut techniques, tools or printing issues. Although I don’t pretend to know everything there is to know about linocut (that’s one of my life goals!) I’m happy to help if I can and I welcome other linocut artists to add their help and advice in the comments section. Do contact me if there’s something you want to ask. I’m working on my christmas cards today and I usually use waterbased inks for lino printing as it’s what we use at school. I have bought myself some linseed oil based ink to try and I just did some test printing. It’s lovely to use but I’m worried about getting the prints to dry. Have you got any tips? I haven’t decided what paper I’ll use. In the past I’ve used really thin stuff like tissue paper so that I can get a clear image just by rollering on the back. 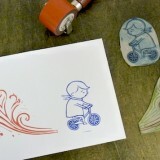 I have just started using water-based inks myself for workshops and printing greetings cards. They are so much easier to clean up and there are lots of different brands to choose from. My opinion is that oil-based inks are still superior for colour intensity and so are worth the extra hassle of cleaning up with vegetable oil if you want perfect results. I try to avoid all solvents nowadays, but when I’m using oil-based inks I finish cleaning my rollers with a tiny amount of turpentine to get them pristine. Drying time for oil-based inks does vary according to the brand of ink and the colour. Anything from a day to a few days is common. Most oil-based inks contain ‘driers’ (or dryers), a chemical which speeds up drying time. You can also buy these to add to your inks yourself. There are two kinds – manganese driers and cobalt driers. Manganese driers are ‘body driers’ which dry the ink evenly throughout (avoiding a glossy surface) and cobalt driers dry from the surface down. Make sure you follow the instructions and wear protective gloves when handling driers – they are toxic. You only need a few drops which you mix in with the ink before rolling it out. If you are in the UK you can buy driers from Intaglio Printmaker. I’m not sure where to get them in the USA, but McClains has an excellent reputation and a good range of inks. They specialise in relief printing and do mail order only. You can also speed up drying time by ensuring a good circulation of air around the prints and hanging them in a warm, dry environment. If you are printing multiple layers try printing wet on wet – you may be surprised how well the ink takes and it means you don’t have to wait for each layer to dry individually. What’s the best way to get clean/uniform looking prints on a budget? Is there a hand method than comes close to using a press? I really like the hand printed look, but I have a few ideas in mind that could really use that smooth even look. All the presses I have seen looked like Big Time $$$. It is certainly possible to get solid, even blocks of colour when printing by hand, although it takes a little time and effort. My East London Printmakers buddy, Chris Pig, is a master of this. I would say the most important things are inking and what paper you use. 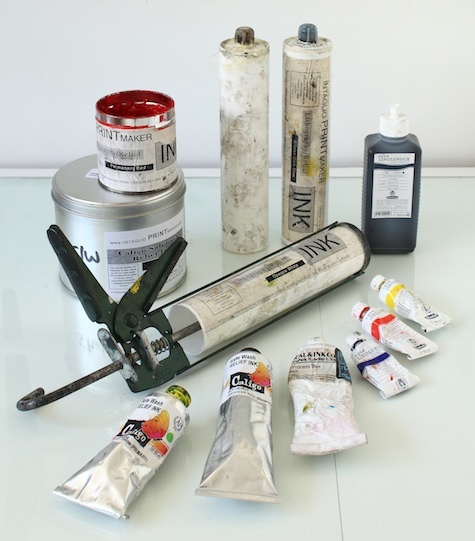 You need a good quality ink, a relief printing ink for professional artists. It should have good density of colour and be quite sticky when you roll it out. You will need quite a lot of ink. It is best to build it up in thin layers so that it doesn’t fill in the carved areas. Inking for the first print will always need extra ink. The paper you use should be smooth and thin. Japanese papers are the best for this although some Chinese papers will work. Japanese paper (washi) is made with long plant fibres which make it incredibly strong. This is important because you need to give it a really good rub on the back using your printing tool and cheaper paper will fall apart. If you can’t afford Japanese paper, choose a thin cartridge paper and place a piece of tracing paper or greaseproof paper on the back before you start rubbing to protect it. You will need a lot of pressure when printing. 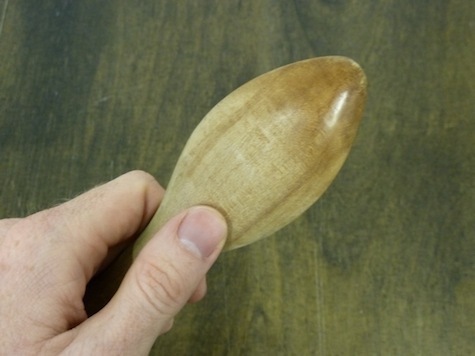 You can use any smooth, hard implement for this – the back of a spoon or a Japanese baren work well. Experiment with using the corner of the spoon/baren to concentrate the force over a smaller area. As you are printing you can lift a corner of the paper to see how you are doing and replace it before continuing. Cheap presses are hard to come by but if you are useful at DIY it may be possible to build one yourself. Have a look online, I saw one once made out of a car jack! Tell us about your favorite printing papers! I usually use Somerset etching paper (velvet or satin, white, 250gsm). It's lovely and heavy, gives a nice matt finish to the ink and allows for slight embossing. If I can afford it I also sometimes use Arches 88. This is a very smooth paper which is a waterleaf paper (it isn't sized with glue) so it is very absorbant. I also love the prints you get on newsprint but the paper doesn't last long and eventually goes yellow and brittle. I will have to write a proper blog post about this when I have time! Thanks for your comment. Regarding water based inks – I’m having trouble with colours that I have mixed myself (from Caligo inks). They look almost powdery when printed. The tone is almost always evenly spread but it is bitty. Colours straight from the can are better. Will oil based inks mix to give a richest more even tone? I can’t say I’ve had that problem with the Caligo inks. Are you adding white to the inks? Sometimes that can be a bit grainy because the pigment is less fine. But I’m not sure that’s what you mean. Oil-based inks are worth a go, certainly, or maybe contact Caligo about it? It’s hard to say for sure without seeing a sample. Sorry I can’t be more help! I’ve had simliar problems with Caligo white – all the other colours have been find, but when I mix with the white I find the ink coverage really patchy. I contacted Caligo who were very helpful and sent me another tin in case it was that batch, but I have to say it’s not much better. Bit stumped really – I’ve been trying to replicate a print that I orginally made with oil based inks in a workshop with no success….I’ll give the somerset a go too – I’ve been using Fabriano. Hi Lawrence. When I want large areas to be white (or the shade of the paper) I ink up my block evenly as usual and then place over the areas you dont want printed with pieces of paper and just shape this paper to the edges of your area. Then when you print, this paper will block the ink. Hope this helps. Thank you! That is a very good tip! If there’s a large area I want completely removed I just cut a section of the lino out with a craft knife. Otherwise I use the largest gouge I have, which is about 1cm wide. I have yet to try power tools, but I’ve been meaning to make a print using just a drill to make different sized holes. I once used a drill, to make dots, but i found that plucking chunks out of the lino with a gouge was actually quicker. I am just getting into Lino Printing after a brief introduction many years ago. We have a large roller press at home with the blankets, can i use this for my Lino prints? If so do you generally lay the paper onto the lino plate or put the plate on top of the paper? On an unrelated note, i see your April workshop at the London Academy is booked up. When is your next workshop? I would love to sign up. This note is in reference to the using of a car, or bottle, jack to create a press. The process is not overly difficult once you find a plan online – though it took me several days to come up with all the pieces to make it. The thing sort of looks like an “easy bake oven” for printmaking. Mine was 15×15 square due to the constraints of my materials. My experience with the bottle jack press: it does give a strong, even print where all the pressure is equal… this works great for small prints (say, 4×5 or 5×6) but if you haven’t found a really, really stiff plate to exert pressure it still makes an uneven printing. That is to say that the center is well printed, but the surrounding areas are considerably lighter (like a halo) and it squishes the block unevenly which wears it out much quicker. Also, at the expense of ruining costly paper with a cruddy print, I just found it was easier to hand press the design with a barren. It was kind of a bummer to end up with the same problem I was having prior to making the press. Though now I have a very sturdy door stop. I just wish it wasn’t a snootful of clams to buy a larger surface press. I just thought I’d let you know how my experience was not as successful as advertised! PooH! Going to plan B…. Hi Melissa. Thanks for your insight! I haven’t tried this myself so I can’t really comment. I do know that as soon as you get above A4 (12 x 9in) things get a lot harder to print because of the pressure required. My experience has been a little different. I found the latest iteration of the car jack plans online, and got a fried with much more highly developed DIY skills to make it for me. So far it’s working pretty well on prints up to A4 size. Haven’t yet tried larger. It takes some practice to get the pressure right, but produces pretty dense and crisp prints. If you’re using acrylics you need to clean the block with water before the ink dries. You might want to try a water-washable oil based ink like Caligo Safe Wash Relief ink as it doesn’t dry out as fast, prints better and is still easy to clean up. Great site. Have you tried printing using a book press? I’ve seen references to it and wondered what the results might be. Just found your site – looks informative. 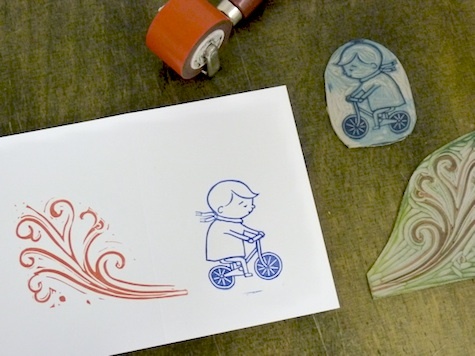 I’m just trying out lino cutting for the first time in years – love the cutting out! But – is there an easy way of adding a little bit of texture when you have cut out too much?!! I have a white area that rather glares and needs filling in with fine-ish lines. I tell you one thing I’m looking forward to — Mitt’s acceptance speech. This thing is going to be the most epic display of oratorical incompetence ever seen in the Western World. My guess is that it will shock in its total lack of ability to deliver an iota of inspiration. People will be shaking their heads in total disbelief. I have used ‘texture paste’ or even ordinary plaster fillers, both can be sanded when dry. Also good for filling in mistake cuts. Can create interesting textures. Alina, I think it is a matter of experimentation. Play around a bit – I have found that some colours layer well on others, while others don’t. Even though you may like the colour of the background print, maybe the colour or pigment you are trying to put on top doesn’t take or is slightly repelled. I have found gold underneath with black on top works a treat. I’ve been working on a two colour print myself today, and printed out lots of the background print to find that when I print the second layer, the background colour was actually too dark and it’s not working out as I had hoped. Bummer, but that’s the way it goes sometimes…. PS Another name for a reduction print – a suicide print… Maybe you can see why now !! Apparently In Israel it is very hard to find a decent printing paper. I searched for all the recommended papers (recommendation I collected from blog posts, books etc), and I could not find Somerset nor Zerkal, Rives or Hocho. Last time I ordered a batch from Jackson, but it took ages, and was waiting in the custom few weeks. Each reseller tries selling what he inports as a good paper for printing, end I end up with papers I cannot use. Now a major re seller offered me Hahnemuehle. Did anyone tried their paper? Just found your website, very useful seeing what other people are asking! I was given some oil based relief ink for Christmas and was wondering if I can loosen them up a bit as they seem to be quick tacky? And if I can, what do I use? The backing not only stops the lino curling, it makes it really easy to cut, especially if you use a bench hook. And of course you can reuse the ply sheets when you’ve finished with them. Just pull the lino off; it should come away fairly easily. Has anyone had problems with Jacksons water based inks separating? I haven’t used them for a while and had a lot of problems trying to get a decent print having found them good before. It’s quite hard to shake them. Any suggestions? Great tips thanks. Can anyone help, I’ve just printed on a new piece of lino with a durethene roller, using Schminke water based inks, on Fabriano 250 paper. my problem is that ‘grease looking spots’ have appeared all over the lino and have transferred to the prints. I’ve never had this happen before but the roller and inks are new to me. I used a fine toothed sanding paper to rub down the lino before starting. Help! as this is a big piece I’m working on. Hi did you resolve this problem, I’m having the same thing and no idea how to solve it! Sorry to bother you with this question but I’ve noticed a small “halo” of oil around the edges of my print. I am using Japanese mulberry paper (lovely and absorbent), and Caligo safe wash inks. I’m doing a reduction print and I’ve noticed it after the third layer. Will this dry out? Thank you. I have quite a bit of brittle linoleum which was subjected to high heat when it was shipped when I moved between two tropical places. Does anyone know if it is possible to revive it or is it hopeless? Presuming you mean real Lino, it is made using linseed oil. The oils will dry out in high heat. Perhaps try rubbing a little linseed oil into the surface (or perhaps boiled linseed oil) on a small piece and check the results once it’s had time to absorb. I’m guessing here, I’ve never tried it but it’s perhaps worth a try? Hi, this is really helpful! Could you please recommend a reasonably priced supplier of the Lino and oil-based inks? I studied Lino printing at college last year and I’m just starting up again at home. Currently got no supplies so literally starting from scratch! Can anyone recommend a good paper for use with Schminke water based inks. I love the inks, but find water based inks leave the paper dimpled, in the same way water colour paint does when used on un-stretched paper. I have found it is possible to stretch the print when it has dried, but it is very risky. Hey, I’m using Cranfield Water Based Relief Inks with an extender. I keep getting an ultra tacky finish when I’ve rolled it. Within a short space of time the roller is pulling the ink from the Perspex as if it’s dried out. I was told to get some Drying Retarder as well and have added this, but I’m still getting similar results. This leads me to think that I’m not adding enough of something. I’ve tried to print and the result is okay, but I can see that the ink was too dry and I have ended up with a stipples effect. Anybody any suggestions on where I’m going wrong please? I’ve been having the same problem this weekend testing these inks. I like the colours, and the one print I managed to make before the ink dried on my glass rolling plate and brayer looked good, but unusable through this almost instant drying. Until reading your message I thought I must just have a bad batch. Have emailed Cranfield to see if they can advise. I am trying to print at home with no press. I learned years ago that when getting ready to apply the ink you should roll it out on a piece of glass until it sounds “sticky”. What happens if you never hear that sticky tacky sound? Is that a problem with the ink? I am using a speedball brayer.